Takorean, hailing from the D.C. area with four locations, is expanding into the Philadelphia market at The Bourse to offer Korean and Latin-America fusion fare including Korean tacos, rice bowls and salads. Still no official date for the opening of The Bourse Marketplace, which is expected to open sometime this summer, but more of the food court's tenants have been announced. Also, The Bourse is expanding its vendor line-up from 27 to 29. So far, 23 have been revealed. When the redeveloped space finally opens, visitors will find a wide range of cuisines inside. 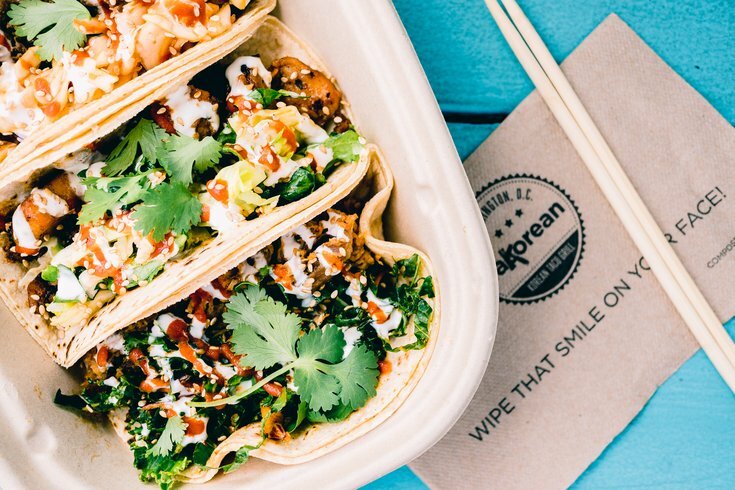 • Takorean – The D.C. eatery is expanding into the Philadelphia market. Find Korean and Latin-America fusion fare at Takorean, including Korean tacos, rice bowls and salads. • Barry’s Buns – Freshly baked goods will be made daily. Specialties include sticky buns, cinnamon rolls and Philadelphia butter cake. • Menagerie Coffee – The speciality coffee shop will serve artisanal coffee and a variety of small bites seven days a week. • Pure Blend Tea – Hailing from West Chester, each unique tea is carefully hand-blended with organic and fair trade ingredients. Look for a wide variety of loose tea blends, as well as superior grade matcha. • Mighty Melt – A collaboration between Mighty Bread Company’s Chris DiPiazza and Stargazy’s Sam Jacobson, Mighty Melt will offer inventive grilled cheese sandwiches crafted from fresh artisan breads with creative flavor pairings. • Scoop DeVille – A Philadelphia institution since 1989, Scoop DeVille lets guests makes custom ice cream combinations. • Mi & Yu Noodle Bar – This fast-casual concept will offer artisanal ramen, udon and pho. • Olive with a Twist – Find fine cheeses, charcuterie and other gourmet products that can create gorgeous cheese plates or picnic spreads. • Chaat and Chai – If you're craving Indian street food, go here. The restaurant closed its South Philly storefront to prepare for the move. • Grubhouse – This eatery will serve breakfast seven days a week. • Ka’moon – Find fast-casual halal-prepared Egyptian cuisine here. • Prescription Chicken – All the chicken-based soups you need. • Bronze Table by Vera Pasta Co. – It will serve made-to-order pasta meals, alongside Italian wines and freshly packaged pasta to-go.